As every other web developer on Earth, I initially clung on to Flickr for my photos, but recently I did a little evaluation round, and instead fell for SmugMug. Therefore, I thought it would be interesting to write down a comparison of those two services. The idea is to take a number of areas and compare them to each other, so you can be judge of which service you think suits your needs best. Both services have understood that the only reasonable way to go is to offer a flat rate for unlimited storage and bandwidth, and this goes for both images and videos. Flickr offers free accounts where there’s a monthly upload limit of 100 MB per month, and one type of billed account, which costs US$24.95 per year. The two of them do have time restrictions for videos, where the limit is 90 seconds for Flickr, and SmugMug offers no video for the Standard account, DVD-quality (usually 640×480) for Power accounts with a time limit of 2.5 minutes, and HD-video quality (not full HD, mind you, but normally 1280×720) for Pro accounts, with a time restriction of 5 minutes (or 10 for DVD-quality). Personally, I think both services are ok for sharing video clips, but neither is probably your first choice if video sharing is the only thing you’re interested in. 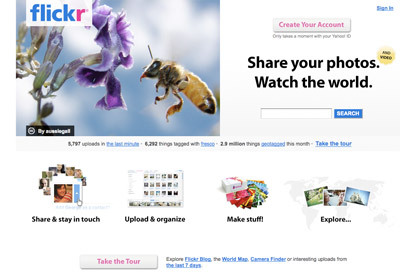 There are a vast number of uploading tools for both Flickr and SmugMug, stand-alone apps as well as integrated plugins. Looking at the official tools, you have the Flickr Uploadr and MacDaddy for Mac users (impossible to get a link to Windows version if I’m on a Mac… 🙁 ). I have compared Flickr to SmugMug intensively for about three months now, and uploading to SmugMug is consistently and considerably faster. Also, Flickr uploads seems to sometimes time out, and either the official Flickr Uploadr is extremely shaky or the uploading service is just not stable (ironically, while writing this, I was uploading to Flickr in the background, and it performed like never before 🙂 ). What I do like about SmugMug is that they, out of the box, offer integrated uploads and instructions for Photoshop, Picasa, Adobe CS Bridge etc. Additionally, as opposed to Flickr where you have to pay for an iPhoto plugin, the official SmugMug Mac uploader has this functionality built-in; a little treat for you iPhoto fans (although, sorry, I’m not one of you 🙂 ). For me, using these services are as much for backup purposes as being able to present my pictures to friends and family. Therefore, one very important part to me is what possibilities I have to download my images again, in their established albums, tagged data etc. What amazes me here is that none of the services has any good and proper support for this! In this area, there are tons of third-party options for Flickr, while I haven’t really found anything good for SmugMug. For Flickr, I use FlickrBackup, and with SmugMug, I’ve tried their SmugDAV solution, but it was incredibly slow and unstable. I would really like to call for an official shape-up here. When it comes to sharing, or, better put, protecting and controlling who sees your images, the companies have taken two very different routes, and both have pros and cons. Flickr has a model where you can set for images whether they should be seen by anyone, people marked as your friends, considered your family or completely protected. This check is done through the help of accounts, where your friends or family have to have accounts to be put into one of those categories. The upside is that you can have a photo set with some pictures available for the public, some more in the same set for your friends etc. The downside is that for images with any sort of protection, this demands of the viewer to have a Yahoo! account. So, basically, this is making it harder to use, but more secure. SmugMug has chosen a path where your image albums should be unlisted or not, meaning that if they’re unlisted, no one can find them through the SmugMug web site or Google. That is, unless they know the URL to it. There was a controversy a little while ago that you could guess the SmugMug URLs and find pictures which were never meant to be shared, but since then they’ve applied GUID-like URLs for new albums (the problem persists with old album links, though). The upside of this is that I can have my hidden images, for instance, pictures of my daughters only meant for family and friends to see, and just give them a URL to navigate into; less hassle for them. I can also password-protect a specific album with a password of my choosing. Another option is to bundle a number of albums into a so-called Sharegoup with a hidden URL, but the problem there is that I can’t have the Sharegroup automatically get new content from new albums, nor make already existing albums or groupings into a Sharegroup. The downsides are that these security settings only apply on an album level, which makes me having to use two albums for the same event, if I want some people to see a few more pictures from it. Also, it’s always a safety risk where you can find hidden pictures by merely getting a hold of a certain URL. Looking at my statistics for my pictures on Flickr and SmugMug, and looking at people contacting me, Flickr seems by far a better way to have your images found and made popular by people you don’t know. I’ve had a number of people contacting me about using my pictures in web sites, children magazines and one for making a drawing through Flickr. Through SmugMug, nothing. Personally, I also think groups seem to work much better with Flickr. When it comes to actually presenting your pictures, I believe this is one of the areas where SmugMug revels. SmugMug offers picture presentation in context, meaning one large image accompanied by thumbnails for the other images in that set/album (just the same thing I addressed with PictureSlides). To me, this is one of the vital things it comes down to in the end: how easy is it to look at the images, and how good to I deem this approach to be when I want my pictures to be seen by friends, family and others? SmugMug blows Flickr away here, if you ask me. Or, to be more somewhat more nuanced: when there’s no context or album, the single image page on Flickr is quite ok for viewing and commenting, but it’s far from pleasing if it belongs to a set. SmugMug has the nice decency to allow a viewer to move back and forward between images with the arrow keys; an approach also implemented by Picasa Web Albums as well. When I wrote my Flickr pros and cons post, Stewart Butterfield (one of Flickr’s co-founders) liked the idea of keyboard navigation, but nothing ever happened (and Stewart has, by the way, now left Flickr). As a bonus, SmugMug also offers the shortcut Shift + arrow keys to navigate between thumbnail pages. I’d say that both Flickr’s Organizr and SmugMug’s Control Panel are very competent tools offering you lots of settings and information control. What I like about SmugMug is that the sorting of images is superb; basically, any way you can think of, they support, making it extremely easy to control in what order your pictures is presented. While Flickr only offers you a few options whether to present images, sets and collections in your user start page, with a SmugMug Power or Pro account, you have the control to write code and tweak your themes any way you want to. This means that with the power that SmugMug offers you for presenting images, at the same time you can give it any layout you want to! Another upside is that you can add your own code for statistics, such as Google Analytics or StatCounter, giving you the opportunity to completely follow up your visitor numbers and behaviors. And, to top it off, with a Power account you can also get a custom URL (given that you can play nice with your host provider) and properly set it up for use with your SmugMug pictures. For instance, my pictures can be found at http://pics.robertnyman.com. In this day and age, naturally every picture has to have information attached where it was taken, right? And for those of us who don’t have a super-new and/or expensive camera, this isn’t automatically added to the images, meaning that you have to add this information manually to your images. In that respect, it’s pretty easy to do that with Flickr as well as SmugMug. But, when it comes to presenting that information, it is always available when viewing an image with Flickr, while it can only be used in your start page to put markers on a map with SmugMug. Being able, in a single call, to get a specified of random images from my entire public collection. Having those images linked to the sets they’re in, with the clicked picture selected and shown. Getting the data as JSON, so I can control it myself, instead of some dreadful page-stalling document.write-scripts. Apparently, this is very hard to find and match. One of Flickr’s official scripts offers this, more or less, except that there’s no way I can get the data as JSON (it might be possible with an API key, but really, should that be necessary?). SmugMug is far behind in this area. They do have an API and JSON data retrieval, but getting random images out of all my images seem impossible. Then they have some solution where I can get a random image, but the call is done for each image, and the image in turn only links to the image’s album, but not the image itself (which is naturally what anyone would want, and, more importantly, expect). SmugMug fans and staff seem very friendly, so I posted a message asking how I could get a JSON badge with random images. I was, to say the least, surprised when I didn’t get any reply whatsoever. Flickr: 5 wins, SmugMug: 3 wins, 3 ties. One would think that I’d prefer Flickr after this, but at the end of the day, SmugMug win in those categories which really matters to me: picture presentation and uploading performance and reliability. But, as you might have seen by now, both service complement each other, sometimes a bit too well. Therefore, at the moment, I use both. This is for spreading the risk with backups, as well increasing the change of my pictures being seen. However, if I am to send over a link to a friend with pictures from an event, I use the SmugMug one, since I think it offers the best and most professional way to present photos. If you’re interested in trying out SmugMug, and you’re already a Flickr user, there’s an excellent Firefox extension called SmuggLr. It worked great for migrating almost 10 000 images from Flickr to SmugMug for me. Only thing to take into consideration when it’s done, is to update possible security limitations and image sorting. What i really like about smugmug is the fantastic friendly logo. Its pure love. Smugmug uses amazon s3 for storage (and ec2 for other stuff) so its wierd that there's no good download support. Robert, awesome write up, thanks! AlbumFetcher is awesome for re-downloading (PC Only so I'm guessing you may not have seen it)…. SmugDav for Mac works for most folks, it can be a bit quirky and I agree, version of AlbumFetcher for Mac would be wonderful. Video? Over the past year we've made a huge commitment to it and we're going even further. Check this out and more in our CEO's Blog. I've tended to avoid Flickr – there I've outed myself. I put up a half a dozen photos once but never went there again. Although I do take a lot of photos at times. It's interesting what you say about it not being the most points in your comparison but the ones that matter most. That's a pearl of wisdom that can be applied to a lot of web development / interface design, too. Discover the features that users really value and how they want to use them. I might check out the trial on SmugMug – I actually didn't get sold on Flickr. I very recently did a comparison between Flickr and Picasa. Haven't read yours yet though so I don't know if we arrived at similar conclusions. At this stage in my life, being a student and all, the price sadly matters most 🙁 Having said that, I have a Flickr account but I only use it to check up on photos that my friends and others have put up. I've only put one up myself. I guess it's a community thing – only a couple of acquaintances use Flickr, so travel photos tend to get placed on my own website (with its currently primitive photo album system… hahaha) and social photos on Facebook. Oh, and by comparing your two links, I like the presentation and flow of the SmugMug one right away. It's immediately classier. 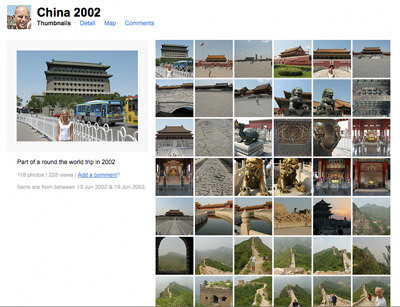 Plus, I've always found navigation on Flickr to be a bit fiddly. An interesting comparison. I just recently signed up on Flickr and added some photos – don't know why I put it off for so long. I haven't had any troubles with it so far. The Uploader program for Windows XP works well for me, I find it a handy way to keep images organized when uploading. And the online configuration for sets/collections, as well basic image editing, all works for me. I did look at other options, including SmugMug, and concluded that Flickr seems to be the foremost choice. Very informative comparison – I'll have to have a closer look at SmugMug. …if you're using Safari, enable the "Develop" menu (Safari->Preferences->Advanced->"Show Develop menu" checkbox at the bottom) and you can then set your User Agent to be something suitably Windowsy. The selected UA only applies to the current tab, so it shouldn't affect other aspects of your browsing. This usually works for me when I'm trying to get a Windows download without firing up a virtual machine. Yeah, AlbumFetcher for Mac would be great to have. I do know about your video advancements, and in time, perhaps it will be the first choice for video clips as well. What currently gets to me is the time limitation. Sure, you've got to have a limitation, but IMHO it should be perhaps 15 minutes or so, to be interesting. For me at least, SmugMug delivered in the areas where I was less pleased with Flickr. As long as you're content, that's what's most important. It is mentioned in the blog post. Personally, I prefer to regularly upload to both services, than just one and using SmuggLr every time. If price matters, join smugmug with the promo code flickr and the memberships are all half price. It was still active last week when I joined. Absolutely, thanks for mentioning that! Fantastic comparison and information. I have been on the fence for some time in regards to SmugMug, mainly due to price. I have always appreciated their quality and professional appearance and your notes helped me jump that fence today. I take and upload on average about 1.5-2.5k pictures a week for online auctions on eBay (ohiobazaar) and for Bonanzle &c. And I have had some troubles with using photobucket, my primary host. It seems they are forever bogged down with ads and videos that they insist on playing during every single upload. That is a huge negative for me due to the volume I'm sending, and the fact that my computer must crash ten times a day during their uploads. I just did the quick sign-up with SmugMug and happily saw that they have a direct link available for Picasa. You can easily send your photos directly to SM. I took about 20 minutes and sent roughly 65 pictures – woohoo! Now, I'm on a farm using a local satellite hookup and I was still able to quickly upload – so I am ecstatic right now. And on top of everything mentioned, the pictures can be sized any way you like and they look sharp. Brad, as of today, 10-16, that 1/2 price code worked. Thank you for that. Price was my first consideration and this helped considerably. One question, Wat about the service the give, (photo printing , backup on DVD ets……) when you live in Europe ? Will the send to mi home ? I don't know, to be honest – I've never tried those services. Thank you for such a thorough review. I appreciate all the details as well as the links to your photos for comparison. Thank you, I'm glad to hear it was of help to you! Do you upload to SmugMug and Flickr separately or do you use a tool/service that uploads to both? I use Adobe Lightroom for managing my photos, and there are plugings for doing that: SmugMug plugin and Flickr plugin. But yes, I start each upload separately, so it doesn't automatically upload to both. If you use iPhoto on a Mac, there are a couple of good alternatives for each service too. On a PC, I'm not sure which way would be the best. Perhaps the official uploaders? I currently am a paid user of SmugMug but am coming up on my yearly payment. I am strongly thinking of moving to Flickr. I think SmugMug looks better. However, there are so many things that work better with Flickr. A blackberry app for example. Iphoto integration in 09 with no add-ons (and I hope soon will work with faces). other sites that tie in. I know I can tie into iphoto with smugmug and I do. But I have found someone who is developing an app that will take faces tags and put them in the flickr upload. Stuff like that. It is just the case of bigger vs. better. Flickr might be a better choice for me as it is so much bigger and thus gets more tie in's and features. Very valid input. I agree and I hope SmugMug will be able to meet that, and build relations with companies and developers so they can have the same kind of spread. I've been reading up on Smugmug A LOT over the past couple of days. Your article and the conversations I've read up have been very helpful. The main thing I have against Smugmug is the $150-ish/yearly fee + 20% off profits + printing costs (Pro account). I'm a college student trying to just make extra cash from portrait photography so the price is incredibly frustrating! Thank you, though, for pointing out the specific features that you love about Smugmug, over the incredible community of Flickr. I realized that the reason I am still considering Smugmug (despite the price) is because of the very same reasons you pointed out: "picture presentation and uploading performance and reliability." From what I've gathered, I suppose it wouldn't be so bad if I just signed up for a Power User account and ditch the printing features. Ugh. Yes, it totally depends on what you want to do with it. The Standard account is probably sufficient for most people, but once you've seen the possibilities, it's very nice to upgrade. Costs a bit, though, I completely agree. —Overlapping concepts like "sets" and "collections"
Thank you for a great detailed review Robert. I always think that photos look better on a black background rather than white. I wish flickr would consider black or at least give you that option. Thank you, Robert Nyman, you are the man! I had only used Flickr up until now, but after two days of intense reading and deciphering the differences between the Two that you have waxed on about in your comparisons, I (being a Macbook Pro man) have decided to look seriously into the Smugmug venue. I am concerned about the video capacity though, as I am awaiting the arrival of my new D3s, (I know, I know, ok, hold the applause, I too am happy in my anticipation), LOL. So, I hope that soon that (video capacity) will soon be addressed! Have a great day, and I look forward always to reading informative and intelligent commentary. Yours, is that! SmugMug and Flickr are great at complementing each other, I think. Personally, I'd definitely recommend trying SmugMug out because it's quite good. In regards to video, if you don't have it in HD, you can have videos up to ten minutes in the Power account (US$59.95/year), which is quite nice, whereas 90 seconds on Flickr is, in my eyes, fairly useless. They still use QuickTime for videos for Mac users, though, which is quite a shame. I just read your review on Smug vs. Flickr. I appreciate your info. So I'm on the first day of my 14 trial and didn't plan on paying anything, but this looks pretty good, so that may change depending if I stay with Smug. Anyway, thanks for your review. It's helped. Glad you liked it! There are so many factors that play in, and most photo sharing web sites naturally have their pros and cons. Play around, and choose what fits you best. I'm at the stage where I want to add my travel images on a site for possible inclusion to a stock image agency. On the one hand I am interested in the Getty 'Call for Artists' group on Flickr, and so torn between creating a pro account for my serious stuff for that group, which of course will be combined with my disconnected fun stuff, or create a Smugmug website for the purpose of showcasing the commercial side of my nature. Smugmug certainly looks the business in terms of image presentation. I just don't want both sites. Why I have stepped out of retirement to do this I don't know! Should I leave it to the toss of a coin? I use smugmug pro. Sure its $150/yr but it allows me to set my own prices and sell my prints through Smugmug. Also with the pro account I can print from Bay Photo which is an awesome print shop in Santa Cruz. They do really good work printing and have a bunch of options that you can offer to clients. Yes, it’s quite nice. Glad you like it! If you want to download all your photos from SmugMug use the FileUploader plugin for Firefox. It can upload as well as download. It supports multiple clouds including SmugMug, Picasa and many more. Very often when starting up Firefox the plugin states that a new cloud is supported. Apologies for the type above. It’s called FireUploader. Glad you like it – thanks for your thoughts! 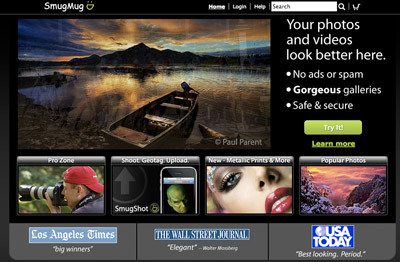 I’ve been a paying user of SmugMug since fall of 2010. We really like how the interface is simple, elegant and fairly easy to use. But one of the key reasons is that we wanted a clean add-free environment. Which we use extensively on our website. On the topic of Bulk Download from SmugMug, I’m not sure when they added it, but on the “Tools” menu of every gallery is a “Download All” link. There is also a place where you can request that an entirely gallery get zipped into a single file. It takes the server a while to finish, but once it does you get a URL of the zipped file ready for download. It starts at 40$/year for non professional accounts, but even at that price it is really unlimited storage. what about comparing “selling” or “quality of prints” or “5 star rating system” and whether or not either of these support either of those i.e. n/a if they dont. these matter to me as much as price etc.